Another new year is upon us and we’ve got plenty of tempting new guitars coming your way to keep your musical creativity flowing. 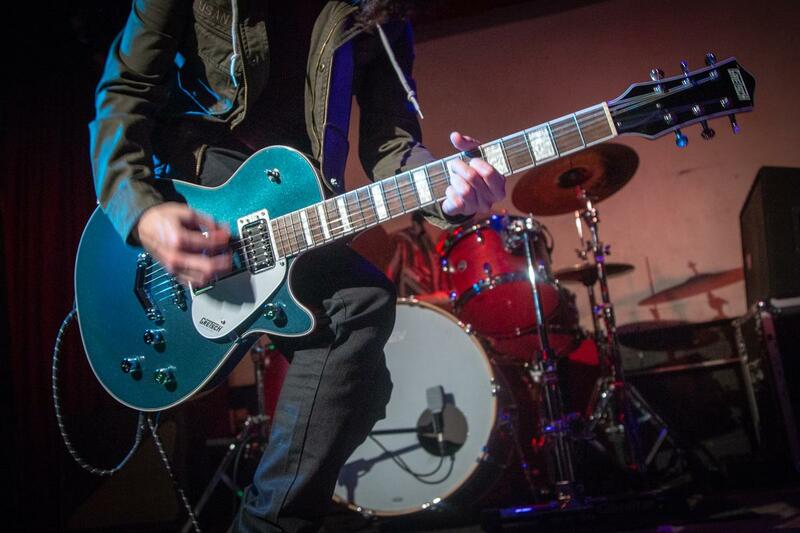 Here’s a quick introduction to 10 of our new oh-so tempting Gretsch models. Want the venerable Black Falcon style, but the full-size hollow body is a bit too big for your body? The 16” double-cutaway maple body of our G6636T Players Edition Falcon™ Center Block is a slightly smaller offering with a chambered spruce center block that enhances body resonance for more organic tone and comfortably lighter weight. Dual High Sensitive Filter’Tron humbucking pickups deliver that classical and powerful warm vintage tone, while gold sparkle binding, gold jeweled G-arrow knobs, gold pickguard and gold hardware finish this beauty off with unmistakable Falcon style. 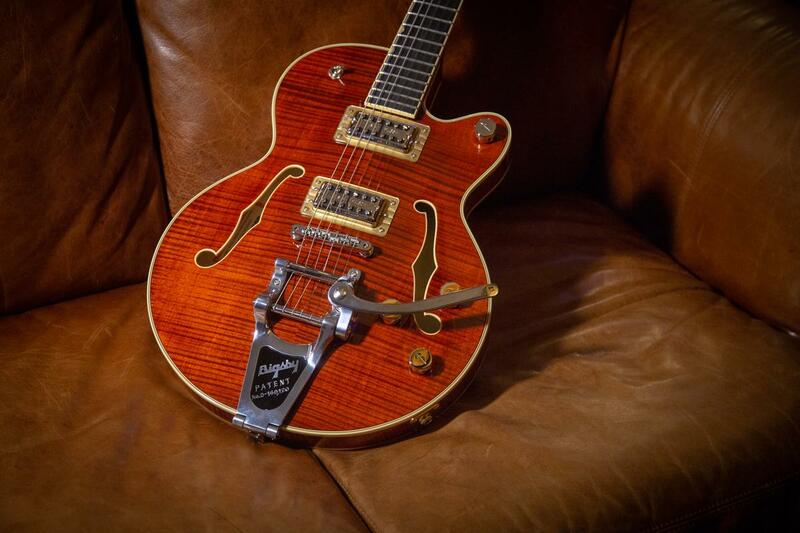 The G6620T Players Edition Nashville® Center Block with String-Thru Bigsby® packs full-blown Music City vibe in a Round-Up Orange finish with tortoise pickguard, nickel hardware and classic Gretsch horseshoe inlay on the headstock. Dual High Sensitive Filter’Tron radiate warm timbre with a significant increase in output and sustain, while a string-thru Bigsby® B7CP vibrato tailpiece adds another tonal dimension. The exquisite Bourbon Stain flame maple top with matching headstock and nickel hardware give the G6659TFM Players Edition Broadkaster® Jr. Center Block an appeal that is unmatched. The smaller 14” single-cutway flame maple body of this instrument is ideal for players with a slight frame. The bright, soaring voice of dual U.S.-made Full’Tron humbucking pickups demands to be heard, while a string-thru Bigsby® B7CP adds the perfect lick of twang. Dive into the depths of the G6659TG Players Edition Broadkaster® Jr. Center Block. Its serene Azure Metallic finish topped with gold hardware is simply irresistible. The smaller single-cutaway body maximizes playing comfort, while enhancing tonal focus and reducing feedback. Body resonance is also enhanced for more organic tone, courtesy of its chambered spruce center block. 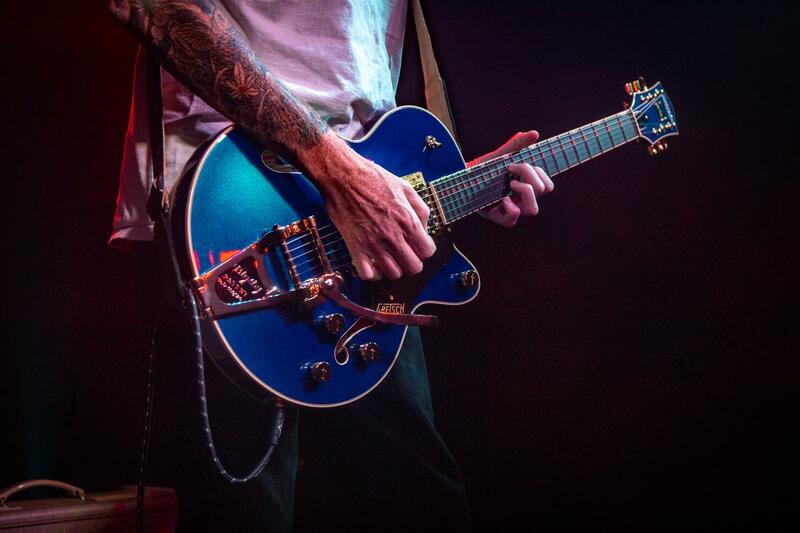 Like all of our Broadkaster models, this little beauty features our U.S.-made Full’Tron™ pickups — delivering full-spectrum sonic range with a growl like any other pickup, in addition to classic Gretsch chime, balance and brilliance. Soar into the realms of endless sonic possibility with the Broad’Tron™ BT65 pickups in the G6228FM Players Edition Jet™ BT. This guitar gem is adorned in an all-new Crimson Stain finish with a tiger flame maple top and nickel hardware, including the V-Stoptail. Designed by pickup mastermind Tim Shaw, the Broad’Tron BT65 forges powerful mids, extended lows and exceptionally clear, yet smooth high ends. The G6228FM is also a dream to play, thanks to its lower set mahogany neck and comfortable 12”-radius ebony fingerboard with 22 medium jumbo frets and our stylish aged pearloid Big Block inlays. 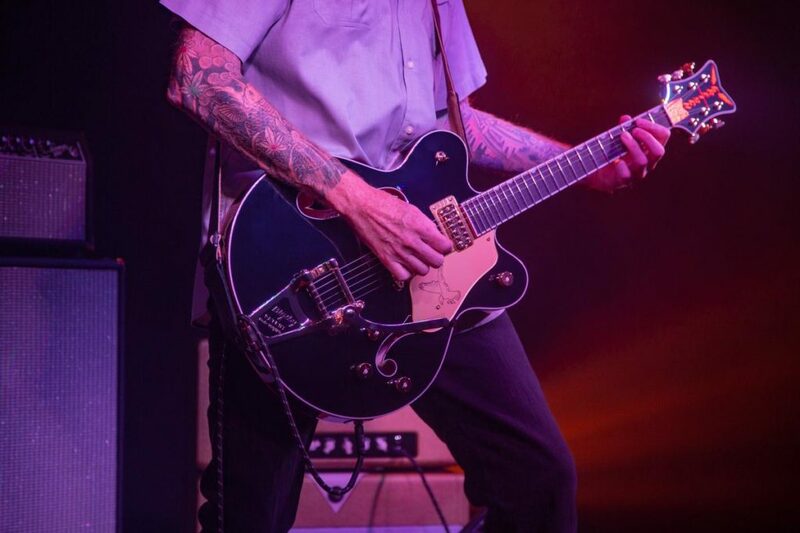 The G6228 Players Edition Jet™ BT with V-Stoptail isn’t short on Gretsch gusto. On top of the sweet Candy Apple Red finish, the Broad’Tron BT65 pickups pioneer new sonic possibilities and wall-shaking power. This stylish model is accessorized with a gold pickguard and nickel hardware, including the V-Stoptail tailpiece for rock-solid tuning stability with classic styling. The starry Silver Sparkle finish of the G6229 Players Edition Jet™ BT with V-Stoptail offers a show-stopping intensity that is unmistakably Gretsch. 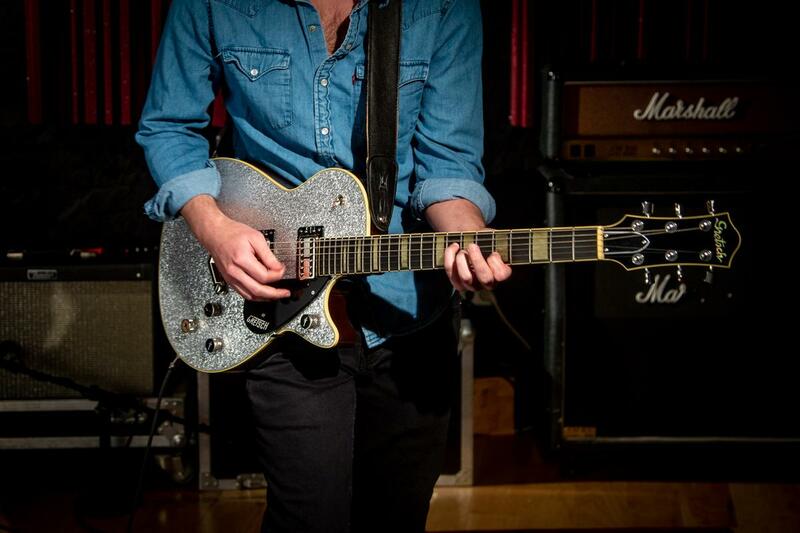 A celestial sonic dream accented with nickel hardware and black pickguard, the G6220 also features a mahogany body and maple top that produces a strong-balanced mid-range tone. Its chambered body design not only alleviates shoulder fatigue with its lighter weight, but also delivers smooth attack. 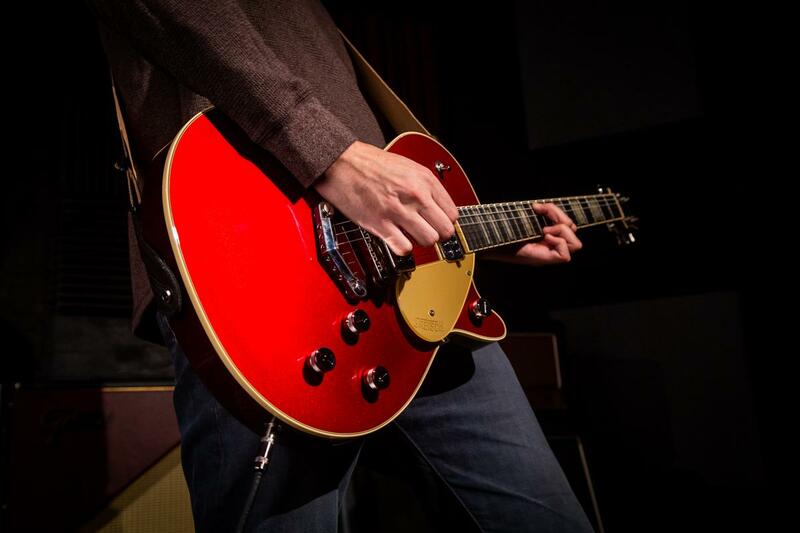 BT65 pickups give this guitar a voice filled with power and fidelity. Don’t be fooled by its diminutive size. The smaller-sized body, chambered spruce center block and dual Black Top Broad’Tron™ humbucking pickups give the G5655TG Electromatic® Center Block Jr. with Bigsby® and Gold Hardware model as much sonic punch as its full-sized counterpart. 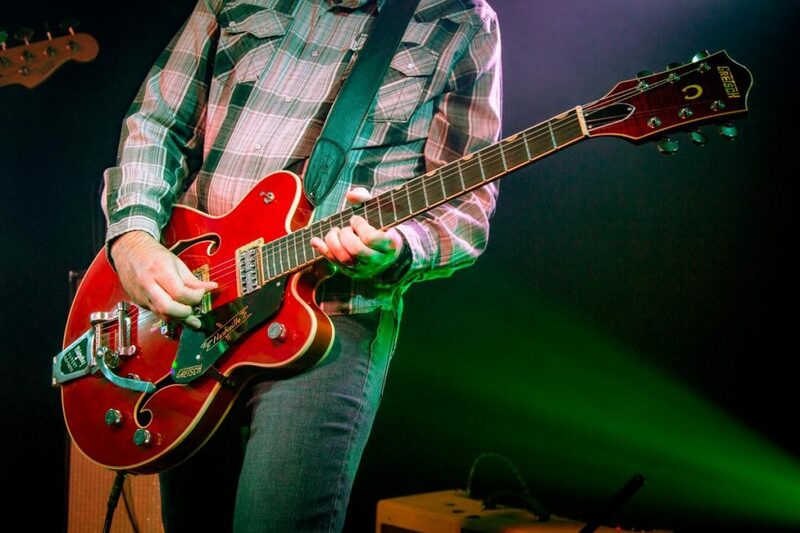 Plus, add some shimmer and vibrato to your playing with the Bigsby® B70 tailpiece. With gold hardware and three new dapper finishes, this model is in a league of its own. Choose your next statement piece between a radiant Azure Metallic, a lush Cadillac Green or a classic Orange Stain. Take tonal control. Black Top Filter’Tron™ pickups give the G5230T Electromatic® Jet™ FT with Bigsby® a distinguished tone that powers through thick overdrive while maintaining definition. 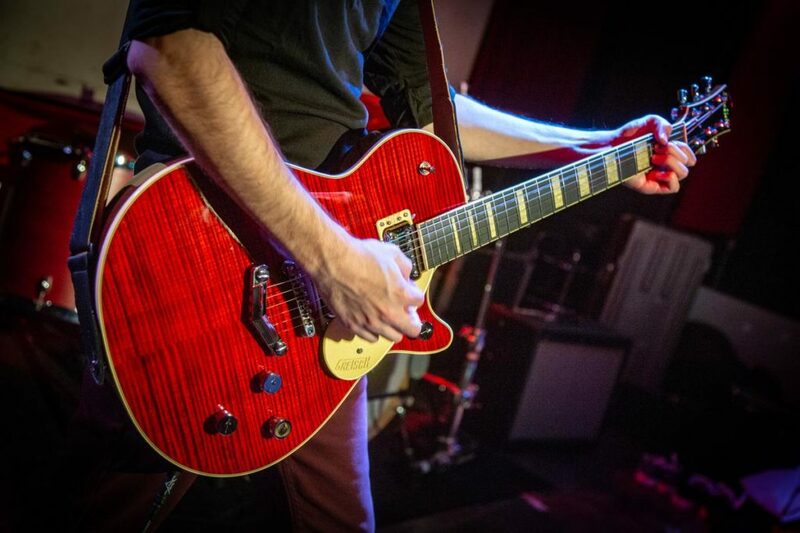 Paired with the chambered mahogany body, these pickups pack articulate notes even when cranked up to the highest gain. 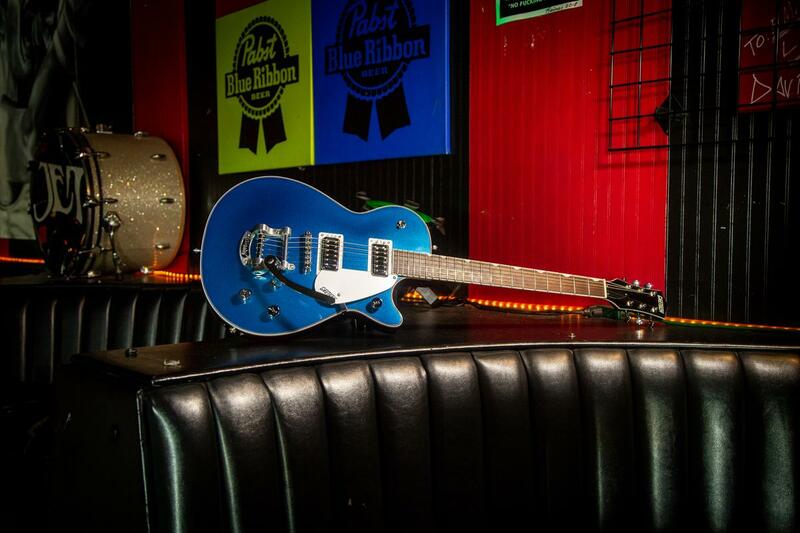 A cool Aleutian Blue finish pairs perfectly with this model’s chrome hardware and silver pickguard. 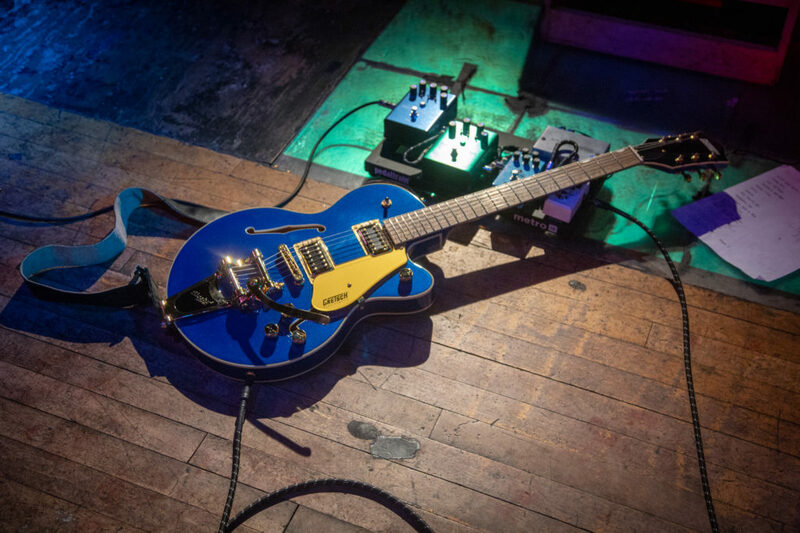 The bold G5220 Electromatic® Jet BT with V-Stoptail is powered with hot Black Top Broad’Tron pickups that deliver thick, aggressive overdrive without losing definition, as well as note balance suitable for the most pristine clean timbre. Suited up in an all-new Jade Grey Metallic finish with chrome hardware and silver pickguard, it’s one that is sure to steal the spotlight. Now that you’ve officially been introduced to our latest lineup, please do indulge!